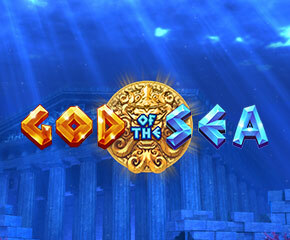 The God Of The Sea slot is the product of Rising Entertainment and comes with great visual graphics. This online slot has an ancient Greek theme and loads of engaging extras. Rule The Waves With The God Of The Sea! The God Of The Sea slot has 5 reels, 4 rows and fixed paylines of 30 and is fully available on both mobile and PC. The setting is the totally magnificent underwater city of Atlantis, which is rendered in truly eye-watering detail. Splendid ruins and some flora and fauna of the deep sea can be seen here, while the whole scene is lit by light that filters in from above. Blue seems to be the overriding colour used here and the reel set is simply but superbly made. Above it are stone blocks that when opened showcase the pantheon of the gods. On the reels of the God Of The Sea slot can be found playing card values, as well as other higher paying icons like a harp, a vase, a golden coin and images of a couple of gods and a warrior. An icy blue image of a massive temple performs the role of the wild and is the highest paying icon. The scatter for its part is the gold coin. Warrior Feature – at random intervals in the base game, the earlier mentioned stone blocks atop the reel set will open and allow the great warrior Ares to appear and smash the reels. This leads to the addition of extra wilds or picture icons to the reels for enhanced wins. Goddess Feature – this is similar to the warrior feature detailed above. In this case, rather than Ares the god of war appearing, the goddess herself chooses to show up and reward players of this slots online with one or multiple wilds. Poseidon’s Hand – this is triggered during base gameplay when the massive hand of Poseidon himself appears on the reels and enhances the probability of triggering the Free Spins bonus round. Free Games – the Free Games feature is triggered by landing 3 and up of the scatter icons anywhere within view. 3, 4 and 5 scatters translate to the award of 8, 16 and 40 free spins respectively. When this bonus round is triggered, players are taken to a splendid underwater temple, where Poseidon can be seen with two glowing orbs held in either hand. One of these orbs must then be selected, and it will trigger either the gold or silver Free Games feature, with each having their own bonuses. In the Silver Free Games, extra wilds are featured on the reels. But in the Gold Free Games extra stacked wilds are placed on the reels, while every warrior and goddess icon is transformed into the icon with the highest value – the wild. The God Of The Sea slot has impeccable visuals, a very interesting array of bonuses and overall is a heavyweight with no peer worth the name!